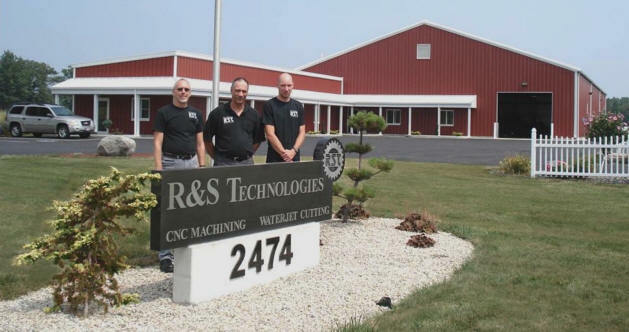 Located in Bellevue, Ohio, R & S Technologies, Inc. has been in business since 1985. Starting out doing only injection molding, we have expanded our capabilities over the years to include CNC machining and Abrasive Waterjet cutting. We also produce an extensive line of wire belt type sprockets and collars. Complimenting our sprockets and collars are discharge yokes which can be used in a wide variety of conveyorized equipment. As our capabilities have expanded so has our manufacturing facility and workforce. Our 14,000 sq. ft. facility is well equipped to handle your requirements in the CNC machining, Abrasive Waterjet cutting, welding, and custom injection molding of small parts. The owners of R & S Technologies, Inc. (from left to right): Gary Shingledecker and Paul Ritz. On the far right is Paul's son Ben - the next generation of R & S.